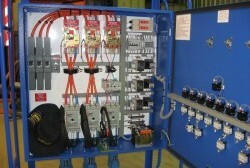 Pump Starters for Fixed Pumping Installations and Portable Pump Installations in 1000 Volt & 415 Volt. Float Control, Current Monitor Control, Manual Operation, and Earth Continuity Circuit Protection in capacities from 5 KW to 300 KW. Hahn has a range of standard designs fully tested and ready for immediate delivery. We can reconfigure these units or build to meet your specific needs. Hire durations can be both long or short term to suit your specific needs. Copyright © 2019 Hahn Electrical Contracting.